Ashley Wesleyan Church, Ashley, Ohio. "Revealed to Disciples," The Jesus Database, an online annotated inventory of the traditions concerning the life and teachings of Jesus. Dr. Gregory C. Jenks, FaithFutures Foundation. LV.1-2, 4, 6-7; Tatian's Diatessaron (c. 150-160). III.5, Ecclesiastical History, Eusebius of Caesarea (c 320). "Forever: and this refers to the manner of the presence of his Spirit, by means of which he makes us partakers both of himself and of all his benefits, even though he is absent from us in body." Section VIII, Evidences of the Christian Religion, Joseph Addison, c. 1715. "The God of Israel, the Saviour, is sometimes a God that hideth himself, but never a God at a distance." "And these were to be determined by the circumstances of things; which made it necessary in baptizing adult Jews or heathens, to teach them before they were baptized; in discipling their children, to baptize them before they were taught; as the Jewish children in all ages were first circumcised, and after taught to do all God had commanded them." "...am with you alway--"all the days"; that is, till making converts, baptizing, and building them up by Christian instruction, shall be no more." "They are to make disciples, or pupils, and scholars of Christ; not great philosophers, but 'babes in Christ Jesus,' who have entered the school of Christ and are to be taught afterwards." Commentary, Matthew 28:16-20 (Trinity A), Stanley Saunders, Preaching This Week, WorkingPreacher.org, 2017. "What does the Great Commission have to do with the Trinity?" "'But Some Doubted...'" Janet H Hunt, Dancing with the Word, 2017. "The Great Calling and Assurance," Glenn Monson, Law and Gospel Everywhere, 2017. "Matthew, Trinity, and Me: Which song shsall I sing?" Andrew Prior, 2017. Commentary, Matthew 28:16-20 (Trinity A), Stanley Saunders, Preaching This Week, WorkingPreacher.org, 2014. "The God of Genesis 1-2:4a provides assurance to those, who work to raise crops against the numerous natural challenges." "Galilean Rendevous," D. Mark Davis, rough translation and notes, Left Behind and Loving It, 2014. "Many translations make this 'they saw' and 'but some doubted.' The 'they' is the implied subject of the plural verb. The 'some' is the curious translation. as 'they' but reduce the pronoun ο? to 'some'? Precedent is 'the 11.' Kudos to the New American Bible (translated by the US Council of Bishops), which renders: 'When they saw him, they worshiped, but they doubted.'" "The Trinity is not a doctrine to which we subscribe because it describes God as God is. God is more. The Trinity is not a set of balls, seven or more, which we have to juggle and somehow keep in the air." Matthew 28, Rob Myallis, Lectionary Greek, 2014. "The Commissioned," Andrew King, A Poetic Kind of Place, 2014. "Reflection for Trinity Sunday," Bob Cornwall, Ponderings on a Faith Journey, 2014. "And so as we go forth into the World, we're not alone. God is present. God is active. God is creating and recreating. God is redeeming. God is sustaining the creation. Yes, God is with us – in Jesus through the Holy Spirit – to the end of the age." "Inconvenient Truth," Don Underwood, Edgy Exegesis, 2014. "What if faithful proclamation of the Good News demands the courage to acknowledge that faith isn't easy?" "The God of Love and Peace," Alan Brehm, The Waking Dreamer, 2014. "It is when we open ourselves to those who are around us, allow ourselves to experience their pain and suffering, and share compassion and kindness with them that we experience "the God of love and peace." "This Is a Football," Steve Godfrey, The Church in the World, 2014. "To baptize to call to a symbolic and public proclamation of burying an old life and rising to a new one. It is to say, 'I am all in.' How today's church desperately needs leaders who will call others to commitment, especially men." Comentario del San Mateo 28:16-20 por Samuel Cruz, Working Preacher, 2014. "The Biggest One of All," David Sellery, 2014. "Of Three Equals One," Thomas Beam, 2014. Those wanting to preach on Psalm 8 and who use a video projector in their sanctuaries will find the awesome beginning of Contact a great addition. This approximately 4-minute clip starts with a NASA view of Earth: we hear the voices and sounds of TV shows, and then as the camera starts moving away from Earth faster than light, we hear radio broadcasts—of old shows, the voices of FDR and Hitler, and more. The sounds fade away as we move beyond the Solar System, pass through star systems, nebulae and galaxies. With careful rehearsing you could show this sequence as the Psalm is read: makes for an impressive backdrop. Commentary, Matthew 28:16-20 (Trinity A), Craig R. Koester, Preaching This Week, WorkingPreacher.org, 2011. "The concluding verses of Matthew's gospel give a vivid glimpse into what it means to be disciples of Jesus." "Reclaiming the Great Commission," David Lose, Dear Working Preacher, 2011. "...if we want our people to get excited about, rather than feel guilty because of, the Great Commission, we need to commit to reclaiming Sunday worship and preaching as the God-given time in which to rehearse and practice the skills essential to Christian living..."
"Doing What You're Told," Alyce McKenzie, Patheos, 2011. "How good are you at doing what you are told? We can't afford to wait until we are perfect and conditions are optimal to make disciples." Holy Textures, Understanding the Bible in its own time and in ours, Matthew 6:24-34, David Ewart, 2011. "These 5 short verses touch on several crucial themes: 1) The authority of Jesus. 2) The purposes of the church: go, make disciples, baptize, teach, obey, remember. 3) The presence of Jesus-now-resurrected. A congregation that is centred on these will not go far wrong. And might even get a fair bit right. " "Can we actually 'waste' a whole day for Sabbath rest and worship? Set aside a whole day for God and each other? What gods are we worshiping when we are unable to 'remember a whole Sabbath day to keep it holy'?" First Thoughts on Year A Gospel Passages from the Lectionary, Trinity A. William Loader, Murdoch University, Uniting Church in Australia. "This is such an important text in the context of Matthew's gospel that there is a danger that its use on Trinity Sunday will lead to too much focus on its tenuous links with the Trinity, so I want to start with the passage itself. It has enormous significance as the climax of the gospel, drawing together major themes of the gospel..."
Lectionary Commentary, Matthew 28:16-20, Valerie Kuykendall-Rogers, The African American Lectionary, 2009. "As I matured and grew, and as I studied the historical significance of the black Church in seminary, I learned what Missionary Sunday entailed?edifying, equipping, and empowering a community to emulate the work of Christ in order to provide a refuge from the daily onslaught of denigration and degradation." Commentary, Matthew 28:16-20, Richard Beaton, Preaching This Week, WorkingPreacher.org, 2008. Dylan's Lectionary Blog, Trinity, 2005. Biblical Scholar Sarah Dylan Breuer looks at readings for the coming Sunday in the lectionary of the Episcopal Church. "We're called not just to baptize. We're not called to make churchgoers, people who include religion as one among many respectable civic activities. We're called to make disciples, people who really follow Jesus as Lord." "The End in Matthew (5:48 and 28:20): How to Preach It and How Not To," Robert H. Smith, Word & World: Theology for Christian Ministry, Luther Northwestern Theological School, 1999. "These two great texts are perfect guides for all our reading, all our preaching, all our living." "The Presence and Power of God," Trinity B, Larry Broding's Word-Sunday.Com: A Catholic Resource for This Sunday's Gospel. Adult Study, Children's Story, Family Activity, Support Materials. "What concepts do you find easy to understand but difficult to communicate?" "The End of the First Gospel," F.F. Bruce, The Evangelical Quarterly, 1940. "All Authority Belongs to Jesus," Rev. Bryan Findlayson, Lectionary Bible Studies and Sermons, Pumpkin Cottage Ministry Resources. Includes detailed textual notes. "Decision Priority 1: Make Disciples" Kwasi Kena's Continue to Change the World Series.
" Jesus commissioned us to do more than just make converts, we are to make disciples!" "...the transformations are not solely experiences of Jesus in his earthly ministry, but are meant to be replicable experiences within the community on the path of discipleship." "Conversion Factors," Frederica Mathewes-Green, BeliefNet. "It's OK to proselytize, but there are times when it's kinder to refrain." Arias, Mortimer, "Rethinking the Great Commission," Theology Today, 1991. Brooks, Oscar S., Sr., "Matthew 28:16-20 and the Design of the First Gospel," Journal for the Study of the New Testament, 1981. Campbell, Cynthia M., "Matthew 28:16-20: Expository Essay," Interpretation, 1992. Day, Dan, "A Fresh Reading of Jesus' Last Words: Matthew 28:16-20," Review & Expositor, 2007. Finley, Stephen C., "Homoeroticism and the African-American Heterosexual Male: Quest for Meaning in the Black Church," Black Theology, 2008. Herrero, Francisco Pérez, "Mission Following the Missionary Mandate of the Risen Christ," International Review of Mission, 2006. Hiebert D. Edmond, "An Expository Study of Matthew 28:16-20," Bibliotheca Sacra, 1992. Holden, James Leslie, "Matthew's Trumpet Blast," Modern Believing, 2010. Kingsbury, Jack Dean, "The Composition and Christology of Matthew 28:16-20," Journal of Biblical Literature, 1974. Krentz, Edgar, "'Make Disciples' -- Matthew on Evangelism," Currents in Theology and Mission, 2006. Krentz, Edgar, "Missionary Matthew: Matthew 28:16-20 as Summary of the Gospel," Currents in Theology and Mission, 2004. Levine, Amy-Jill, "'To All the Gentiles': A Jewish Perspective on the Great Commission," Review & Expositor, 2006. Meier, John P., "Nations or Gentiles in Matthew 28:19?" The Catholic Biblical Quarterly, 1977. Meier, John P., "Two Disputed Questions in Matthew 28:16-20," Journal of Biblical Literature, 1977. Schnabel, Eckhard J., "Israel, the People of God, and the Nations," Journal of the Evangelical Theological Society, 2002. Smith, Robert H., "The End in Matthew (5:48 and 28:20): How to Preach It and How Not To," Word & World, 1999. Soares-Prabhu, George M., "Two Mission Commands: An Interpretation of Matthew 28:16-20 in the Light of a Buddhist Text," Biblical Interpretation, 1994. Sparks, Kenton L., "Gospel as Conquest: Mosaic Typology in Matthew 28:16-20," The Catholic Biblical Quarterly, 2006. Thomas, Linda E., "Anthropology, Mission and the African Woman: A Womanist Approach," Black Theology, 2008. Thomas, Robert L., "Historical Criticism and the Great Commission," Master's Seminary Journal, 2000. "The Great Omission," the Rev. Dr. Charles Reeb, Day 1, 2014. "Great Omissions from the Great Commission," Brian Stanley, Faith and Leadership, 2012. "Formula For Life," Trinity Sunday, Larry M. Goodpaster, SermonStudio. "Turning the Great Commission on Its Ear," the Rev. Dr. Rob Nash, Day 1, 2008. "Blah, Blah, Blah, Blah...Love," the Rev. Dr. James B. Lemler, Day 1, 2008. "The Trinity," "Go, go, go, go, go," Sermons from Seattle, Pastor Edward F. Markquart, Grace Lutheran Church, Seattle, Washington. "It's Not Over," the Rev. Robina Marie Winbush, Day 1, 2002. 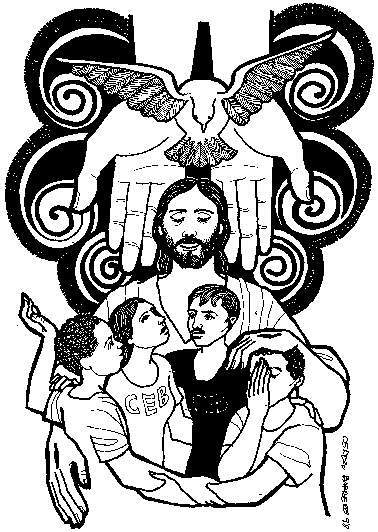 Worshiping with Children, Trinity Sunday, Including children in the congregation's worship, using the Revised Common Lectionary, Carolyn C. Brown, 2014. 2011. "Storypath Lectionary Links: Connecting Children's Literature with our Faith Story," June 15, 2014, Union Presbyterian Seminary. Connections: Genesis 1:1-2:4a and There Was an Old man Who Painted the Sky by Teri Sloat, 2 Corinthians 13:11-13 and The Storytellers Beads by Jane Kurtz, Matthew 28:16-20 and A Mother's Promise, by Lisa Humphrey. 2011. "The Great Commission," Illustrating the Story (lessons, children's sermons), coloring pages, activity sheets, crafts, children's songs. MSSS Crafts. "Delivering the Invitation," Charles Kirkpatrick, Sermons4kids.com. "Jesus Tells the Disciples What To Do," Sunday School Lessons: Family Bible Study, art projects, music, stories, etc. Matthew 28:20, memory verse activity, MSSS Crafts and Resources for Bible Stories. "The Three Little Missionaries," John McNeil, dramatix. "Mixed Up Mission," Eric Fisher, dramatix. "High above the Clouds," from A Certain Jesus by Jose Ignacio and Maria Lopez Vigil. Ideal for catechetical and liturgical dramatization of today's gospel. Claretian Publications. Matthew 28:16-20, at Cerezo Barredo's weekly gospel illustration. Liberation emphasis. Hymns with Scripture Allusions: Matthew 28:18, 19, 20. The Cyber Hymnal. "Your Fingerprint," Brenton Prigge, NewHymn, a new, relevant hymn set to traditional tunes. "The Great Commission in Response to the Trinity," Worship resources for Trinity Sunday based on Matthew 28:16-20, Wayne H. Keller, SermonStudio. "Ascension," from La Corona by John Donne (1572-1631).